The present Bathurst (Town) Square first appears on the 1833 map and is signed by Thomas Mitchell, the Surveyor General. 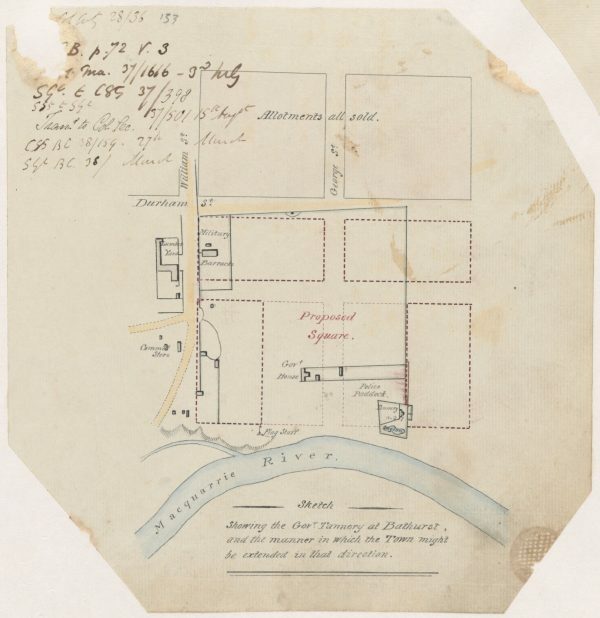 Among Governor Darling’s instructions to Mitchell were to omit town squares. Darling was intent on rendering the Colony a place of terror, and had no town planning ambitions beyond the pragmatic needs of an expanding colony. Governor Macquarie’s party had wisely erected his Bengal tent and a makeshift Flag Staff on a slightly raised platform of land which fell gently to either side at the river’s edge. From the Flag Staff, Meehan had followed the gently sloped ridge line up towards a distant hill called Wahluu by the Wiradjuri people. This was a relatively flat, well drained parcel of land suited to the tiny Settlement which, at the time, was primarily a stock reserve with rudimentary Government functions. The Flag Staff on the Macquarie (Wambool) River bank in the painting marks the site of Bathurst’s establishment by Governor Macquarie on 7th May 1815. 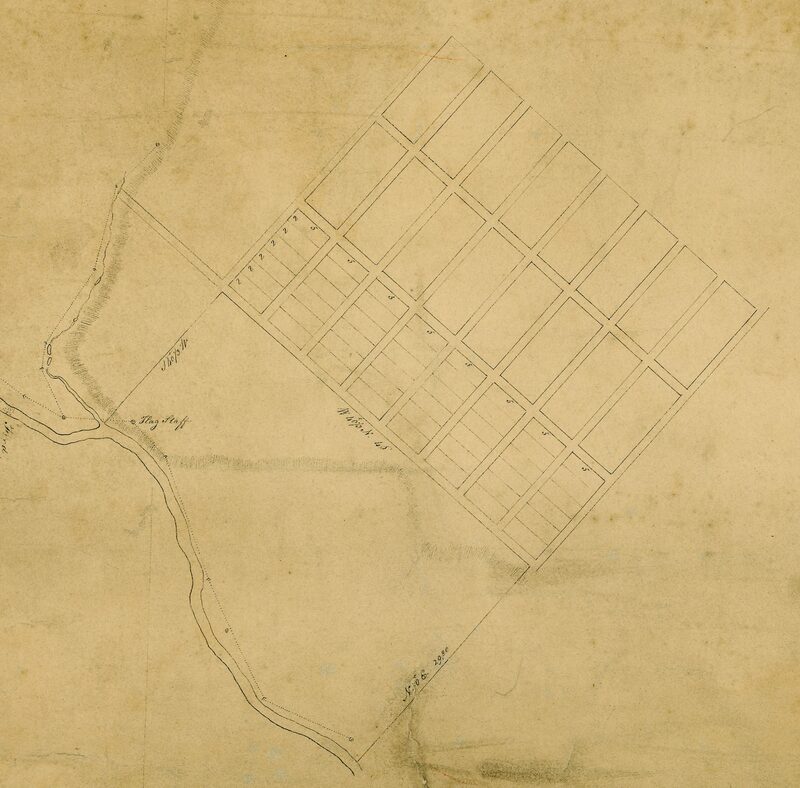 Deputy Surveyor-General, James Meehan, drew up plans for a town using the Flag Staff as his survey point. 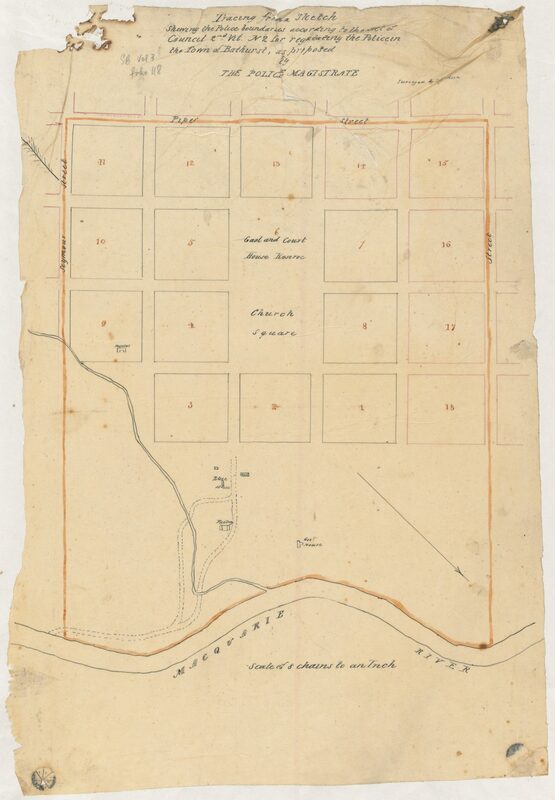 Meehan drew up plans in 1810 for five new towns, including Windsor and Richmond including “in the centre of each Town a Square Space of Ground” for special use. Macquarie’s Bathurst never made it off the plan. 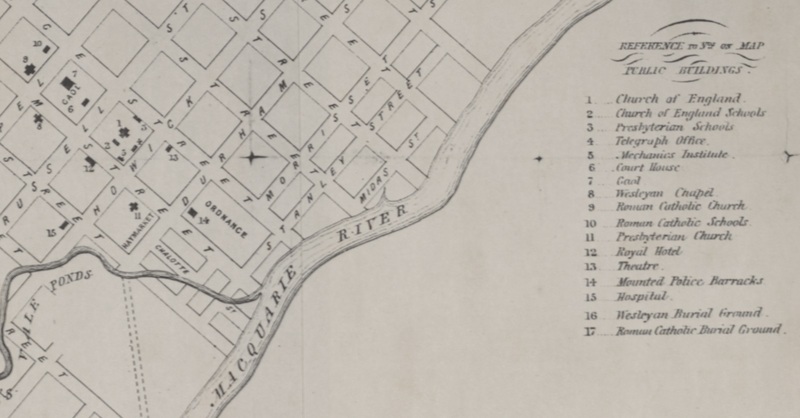 In the 1830s, Macquarie’s Flag Staff was again used – to lay out the town we know today. A central Square appeared on the new town plan. A line drawn from Macquarie’s Flag Staff, marked by the Bathurst Bicentennial Flag Staff, equidistant between George and William Streets, passes exactly through the centre of the Bathurst Town Square. Mitchell adopted exactly the same line from the Flag Staff, but arranged his Plan on a square grid basis and set out what was essentially a Roman Town Plan, with a central space which he clearly marked Church with Government institutions bounding the square. 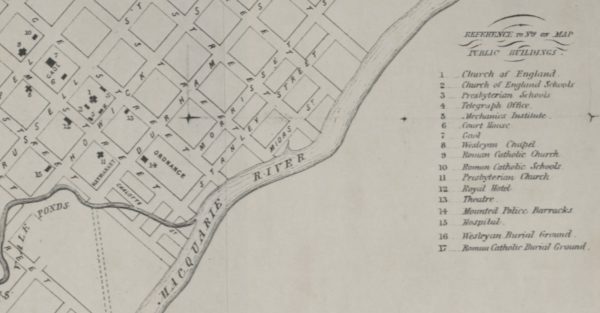 This resulted in a Macquarie Town being developed by Mitchell under Darling and significantly, with a town square, which Macquarie would undoubtedly have found most acceptable. It is remarkable that both the Flag Staff of 1815 and the Town Square of 1833 – the origins and the future of this City – have now been reinstated and are a permanent legacy of Australia’s oldest inland colonial settlement. Shows the Government Tannery and the manner in which the town might be extended in that direction to keep key government precincts intact. Initially it was proposed that there be a Square in the riverside precinct with the Government House complex being its sole occupant. Surveyor Davidson drew this sketch of the Bathurst town plan around 1838 setting out the town’s boundaries for police purposes. Davidson has given the square a name, Church Square. On other plans it was only ever referred to as Square. He has united the Square seamlessly with the neighbouring Gaol and Court House Reserve by removing the intervening section of Russell Street. 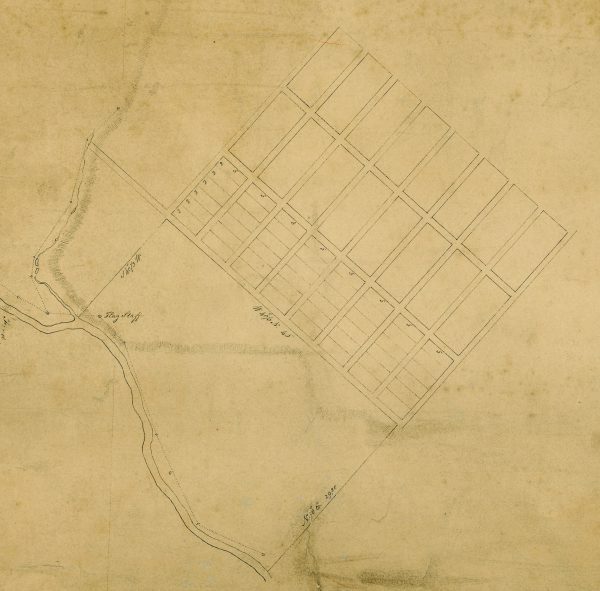 This plan replaced the 1832 and 1833 Town Plans. As well as recording developments from 1832 to 1846 the Plan was used until the early 1860s in the Sydney Office of the Surveyor General. A Church remains in the centre of the Square. 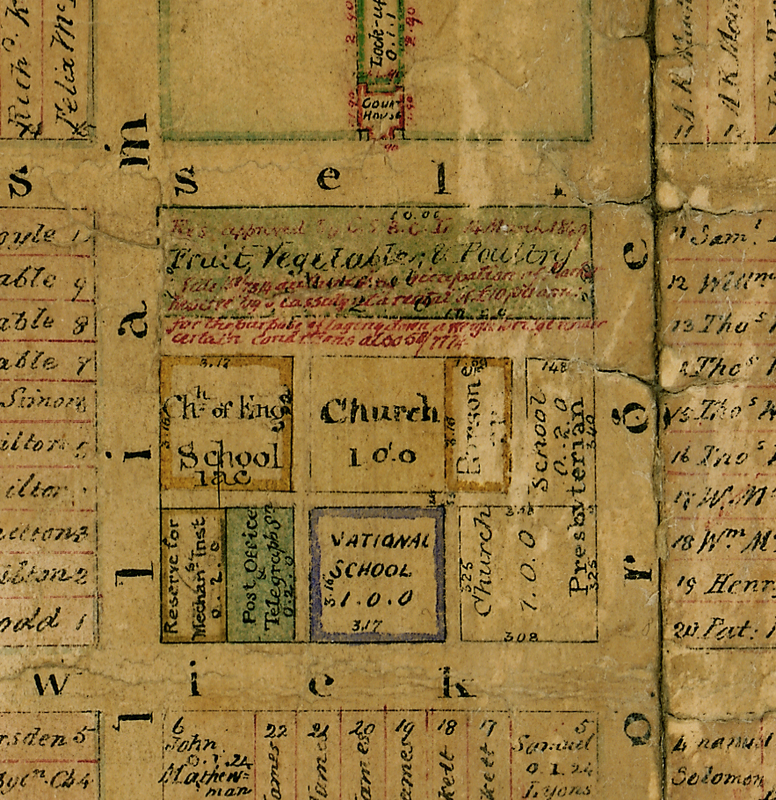 As allotments were made available and sold, details were written on the Plan. The names on the allotments are those of the first owners. The painting shows from the south looking north. 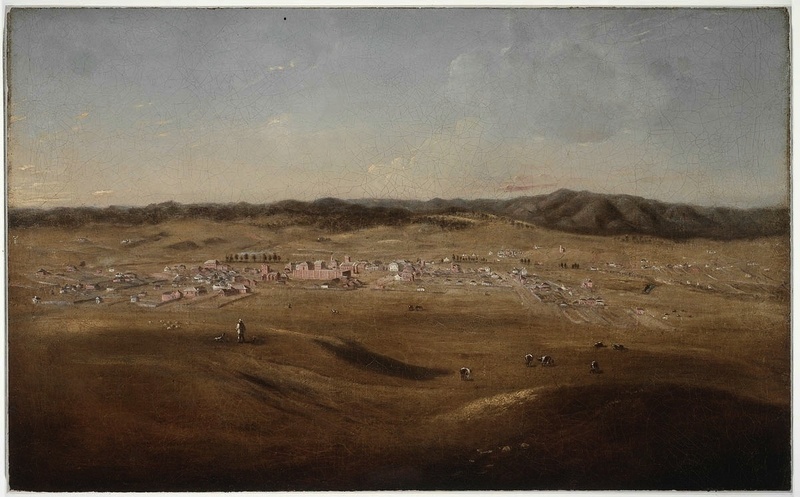 Backler’s painting dates from when Bathurst’s citizens were busy dividing up the Square. Putting key community institutions together into one compact space made sense. This would make efficient use of an otherwise empty block in the middle of a settlement peppered with empty spaces. This landscape was painted by an unknown amateur artist sometime in the mid-1860s. Included in the Bathurst Directory, with a ‘street listing’ of the town’s businesses and residences. 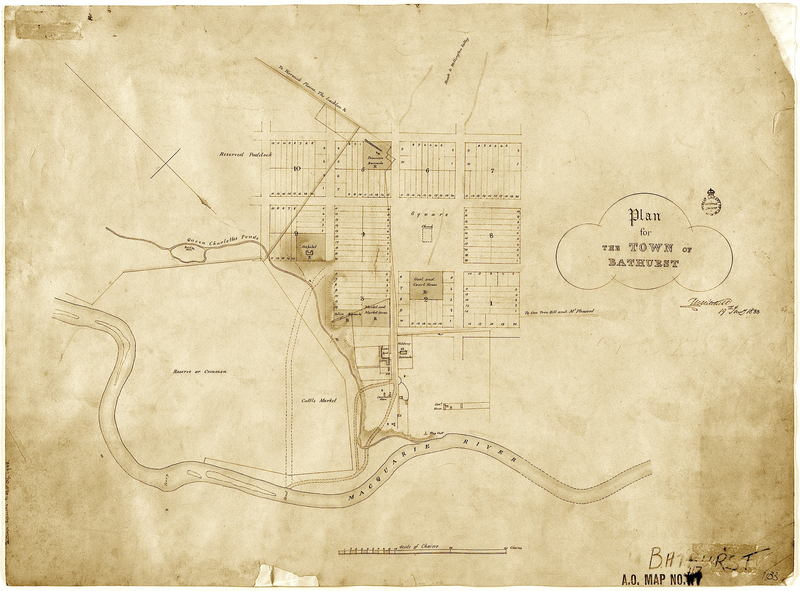 By 1862, Bathurst had become an important commercial and administrative centre for the region’s goldfields. Five buildings in the Square head the list of the town’s significant public buildings. This engraving reveals the Town Square. By the last decade of the 19th century, the Square with its churches and public buildings had become a showpiece of the city. St Stephen’s Presbyterian Church, and the Bathurst Public School (now the Australian Fossil and Mineral Museum), are among the very few surviving significant buildings. All Saints’ Cathedral has been rebuilt and the Church School building has been adaptively re-used. The School of Arts and its adjoining Hall have been demolished. Gates and fences now fracture the tree-lined laneway shown running across the Square between William and George Streets. Some later developments have enhanced the Square, notably the Bathurst Technical College (former TAFE building) built in 1898. Demolition of the 1871 Market building in 1909 opened the way for today’s King’s Parade. This view captures the Square on the eve of major developments in the 1960s and 1970s with buildings demolished and new ones erected – e.g. replacement of the Anglican Cathedral. On their respective corners on William Street, the imposing Exchange Building and the iconic School of Arts were replaced with modern buildings. The School of Arts Hall, where Melba sang, gave way to a parking lot! 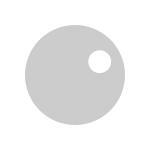 We can see that the Square is different in appearance and usage to neighbouring blocks. The Square has experienced many changes within living community memory, and we should be both inspired and encouraged to make the Square of the future as we would like it to be.